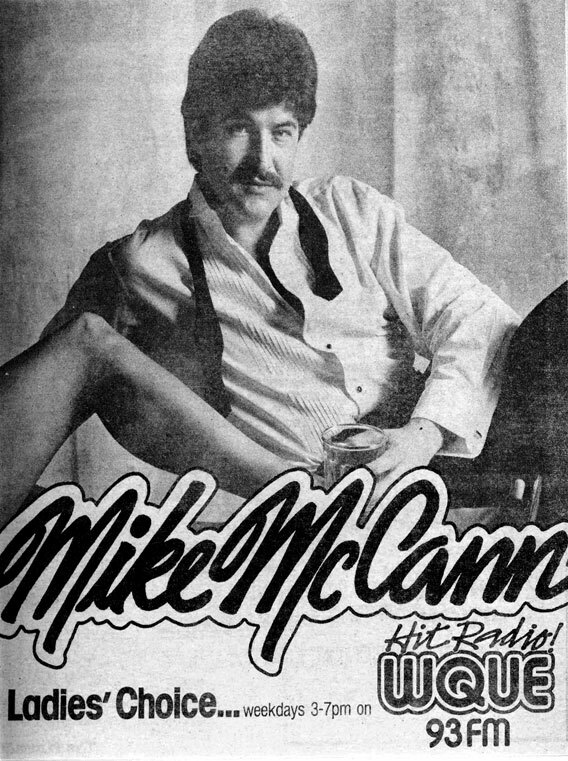 It’s kind of funny after all these years and all this time, but I’m still asked about the ‘Mike McCann’ thing. After all, most disc jockeys (as we were called back in the day) or air personalities on the radio used a stage name or alias for on-air purposes. 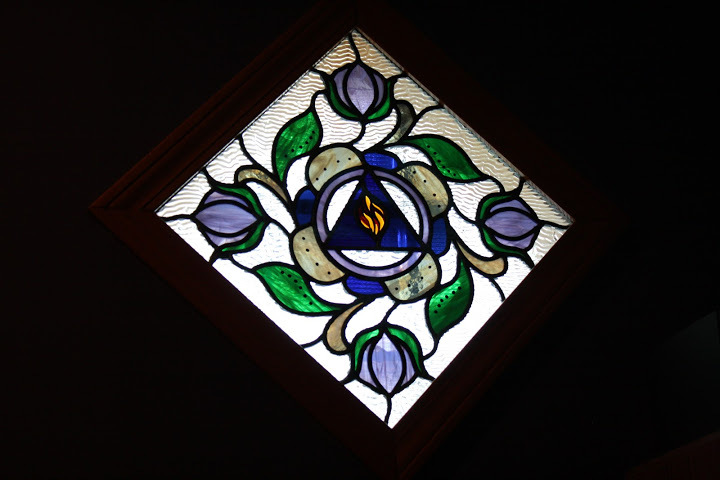 Perhaps this gave us a more dramatic & imaginative persona, but it also assured us some form of anonymity and privacy. Some form. A Pennsylvania native with roots further back in Austria & Hungary, and with brothers & uncles who’ve actually mined coal for a living, I’ve long been proud of the family name ‘Ziants’, but never used it on the radio. 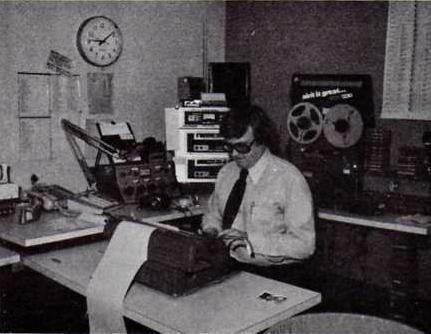 In fact, through 12 years on-air, all through my tours of duty in Harrisburg (WKBO), Saint Louis (KSD), Nashville (WLAC), and Philadelphia (WIFI) … I was known to the masses as John Saint John! And it really worked. I could play on and riff on that name all day long … ‘Philly’s one radio saint – that ain’t’, or (in St. Louis) ‘preaching the gospel according to St. John from the banks of the Mississippi’, and … well, you get the idea. In fact, some of my best pals & brothers-in-arms from along the banks of the Susquehanna now belong to the ages and pages of broadcast history. Big names all – Charlie Adams, “Big Jim” Roberts, Marv “The Goose” Goslin, Fred “Honzie” Honsberger, Jeff Kauffman, Gary “The Pit” Magill … much love & respect, my brothers, and prayers to ‘the other side’. I cherish the time we spent ‘in the trenches’ together. Your names – and broadcast contributions – are now the stuff of Legend. But you know, names, people and places will always change … and upon my arrival in New Orleans in 1983, so did the “John Saint John” thing. 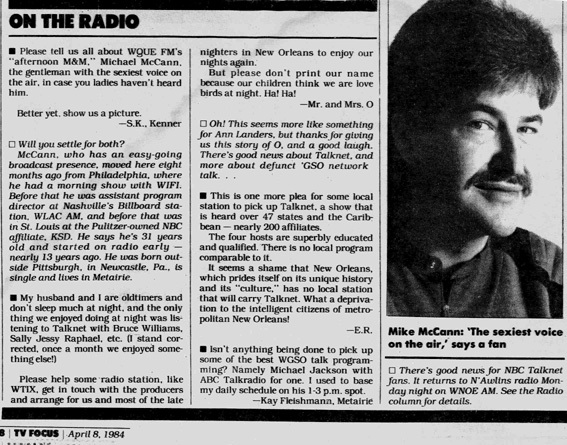 Q-93 (owned at the time by Insilco, an international silver company, really) employed a mid-day jock (who still today does production for Entercom’s WWL) by the on-air name of STEVE St. John … a jock that I would have to follow in afternoon drive! Uh-oh. 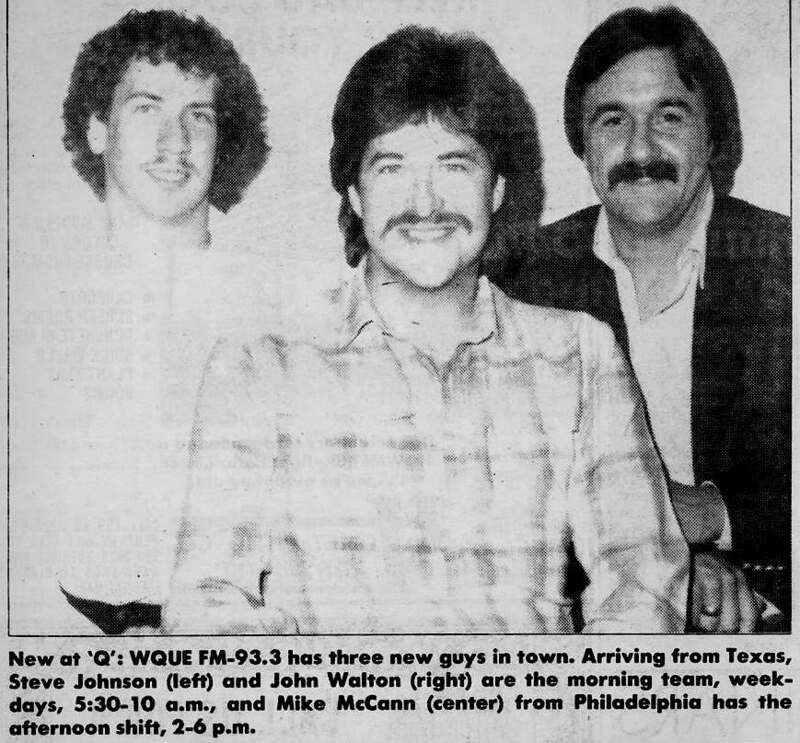 WQUE management loved what I had been doing on-air in Philadelphia, and flew me down to hire me in June of 1983. But the name had to go! Oh well, (sigh) what’s that old Billy Shakespeare line about, “A rose by any other name…”? So, ‘Mike McCann’ was born. And in one fell swoop, Q-93 hired me for afternoon drive … and these two crazed characters out of Beaumont, Texas – Walton & Johnson for morning drive … all in that one fateful week! 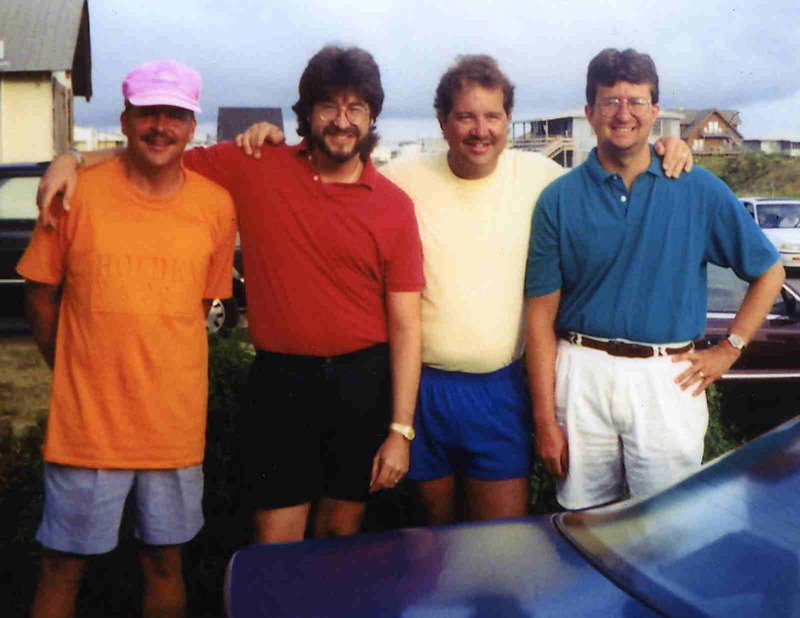 Now, at that point in time, John & Steve had only been together for 5 months as a team, having met for a breakfast and formed their alliance just a half year before – in Beaumont. I had been a top-rated and tested major market air personality for years, and was looking to do mornings at Q, but management had other ideas. And that is the subject for yet another blog… another time. What’s in a name? The answer, my friend, is blowin’ in the wind. Or is it … ON it? Airlift Productions ~ Audio Alchemy from NOLA since 1984! 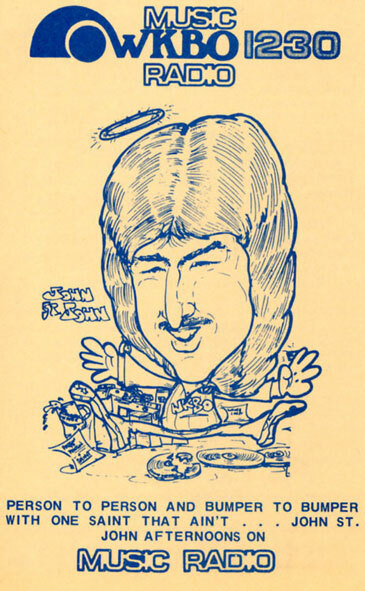 I first met Mike Pintek in 1975 at a quaint 1,000 watt radio station in a far off land known as Pennsylvania. And I say ‘far off land’ because, as a ‘damn Yankee’, I’ve called New Orleans home for 35 years now and seldom return to the rolling hills of Pennsylvania and the land of my birth. Pintek served as the afternoon news dude for John Saint John (he said, using the 3rd person) every afternoon as, daily 2-6 pm, we entertained our “fighting troops in the commuter combat zones” of the state capital. Night times were different stories. As 24 year old guys, away from home, single, hormonal, it was bars, night clubs, and the like – and, of course, Monday Night Football watching with the rest of the boyz, especially when the Steelers were on. 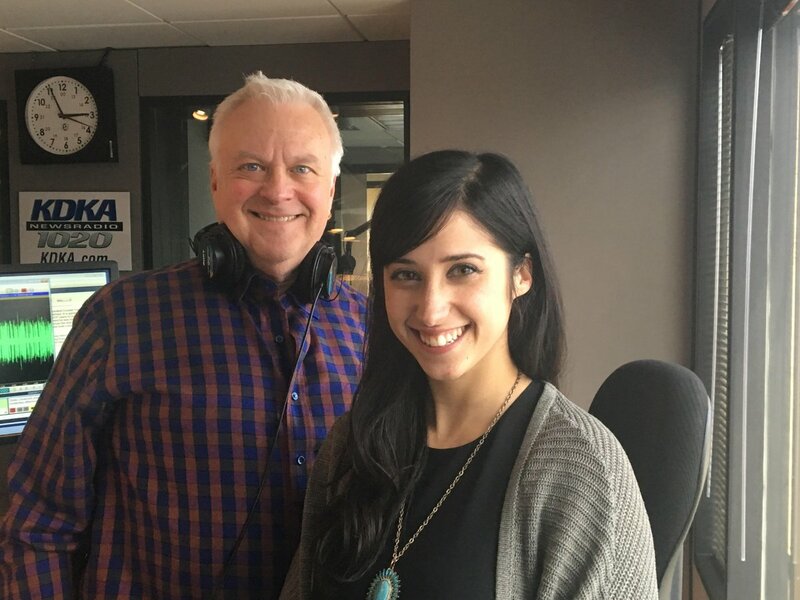 Give a listen to afternoon drive in the Bicentennial year of 1976! Just don’t judge us too harshly. Shucks, we were only 24 and still wet behind the headphones. So, where am I going with all this? Well, last week up in PA brother Mike decided to drop his body and move to “the other side” – dead at 65 from pancreatic cancer complications. And I just came here to unpack a few things. 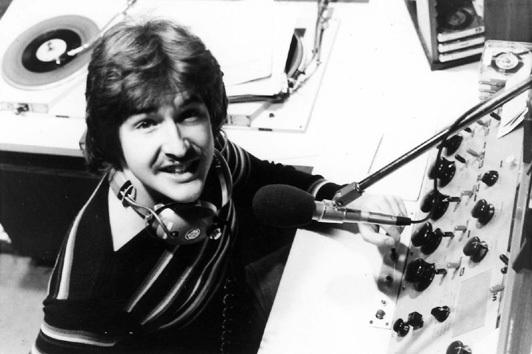 Through many of my now-over-30 years of self employment with Airlift Productions, Mike stuck to his radio guns and went on to entertain Pittsburgh, PA with a highly-rated talk show at legendary 50,000 watt behemoth KDKA for 30 years! What a testament to his awesome powers of communication, longevity, innate talents, and skill. 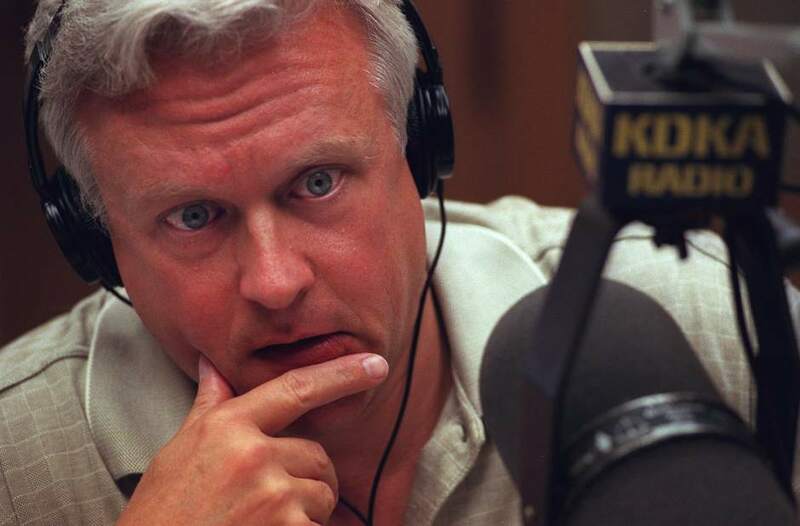 Mike Pintek was born to the radio. Yet, here in 2018, many folks just don’t get it. Radio, just like wartime, bonds its warriors – like crazy glue. And as Garth Brooks once opined, those who live ‘outside the fire’ will never fully understand those living within… and consumed by it. Mike and I were crazy glue bonded warriors living inside the fire, living lives never fully understood by the overwhelming majority who never felt the pressure, the joys, the daily combat of on-mic performance. And my warrior buds continue to fall by the wayside, gone, but not forgotten…. 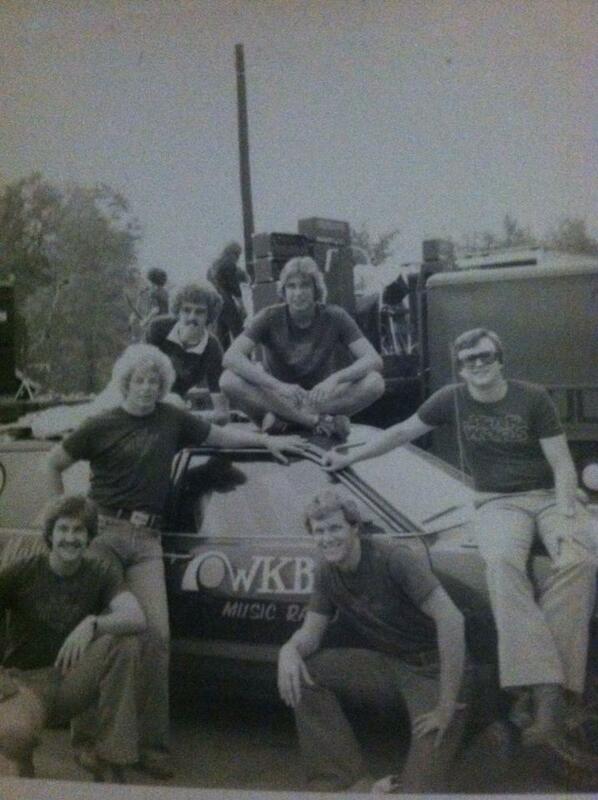 Joe Wambach, Fred Honsberger, Marvin ‘Goose’ Goslin, ‘Big Jim’ Roberts, Gary Magill, Jeff Kauffman, Charlie Adams, Rick ‘Chris’ Andree, J. Al Dame – every single name here, fellow WKBO warriors in the broadcast trenches with Mike & I, now … gone. 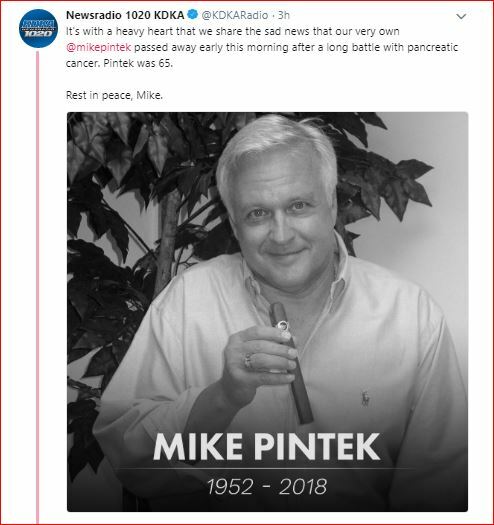 Now, like so many of our comrades, Mike Pintek has fought his last fight. But you wanna know something? Everyone has to die. But not everyone truly lives! While way too many folks today live half-realized lives, commuting to jobs they really don’t like, at hours they don’t care to work, and working for people they don’t respect – Mike and I, like crazy glue bonded warriors, never spent even a day of our lives like that. 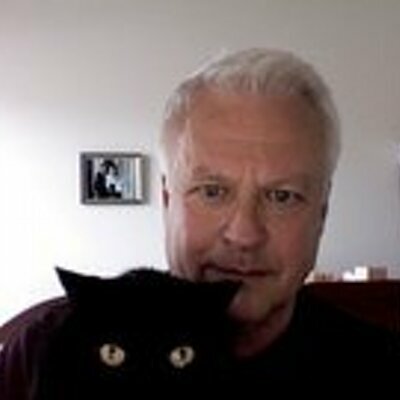 Mike’s final Twitter Profile Pic – how catty, huh? Oh, and one hell of a news room.